RAPAPORT... Diamond resources at Mountain Province’s exploration project in Canada’s Northwest Territories are 74% higher than the company originally estimated, according to a revised evaluation. 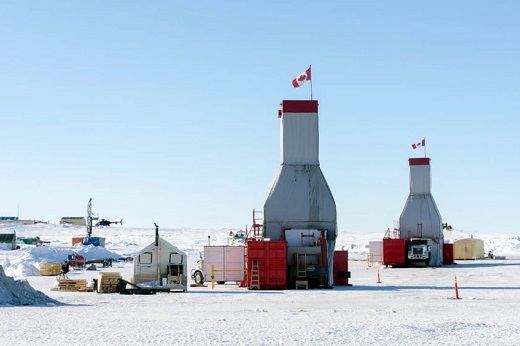 The Faraday 2 deposit, one of three pipes in the miner’s Kennady North project, has 5.5 million carats of diamonds, a recent study by external consulting companies Aurora Geosciences and SRK Consulting found. That figure was reevaluated from a 2017 estimate, which listed the mine’s total contents at 3.13 million carats, Mountain Province said last week. Mountain Province’s stock rose nearly 10% Thursday following the announcement. The new estimate includes the northwest extension, a pipe discovered in 2017, which extended the deposit by 150 meters. The Kennady site lies approximately 10 kilometers northeast of the company’s Gahcho Kué project. Aurora also updated Kennady’s average price for rough from the site to $140 per carat, a 25% improvement versus the previous estimate of $112 per carat.